Putting on the armor of God isn’t about us fighting our own battles. The Armor of God is about us using the the offensive and defensive weapons that God has given us to maintain our position of victory in Christ when attacks come against us. It’s about us knowing our position in Christ Jesus and standing firmly in that place, refusing to be moved. 1. We must tighten the belt of truth ~ The truth is Jesus, the Word of God. We must refuse to accept any interpretation of God’s Word that does not reveal the freedom that Jesus came to give us. 2. We must wear the breastplate of righteousness ~ We must be fully aware of who we are in Christ Jesus. We must know that we are already righteous, we are not trying to become righteous. 3. We must place our feet in the shoes of peace ~ Jesus gave us His peace; we didn’t receive just a portion of His peace we receive all of His peace. 4. We must hold up our shield of faith ~ We have to have faith in Jesus, regardless of what we see feel or hear. We have to stay focused on the Lord and faith in His power, faith and abilty, not our own. 5. We need to wear the helmet of salvation ~ Salvation is mulitifaceted—it is not just going to heaven. Salvation consists of everything that we need to live a victorious life. 1. We pick up the sword of the Spirit (the Word of God, who is Jesus) and use it ~ We must come to know Jesus and His heart toward us; and we must stand in and speak forth that truth. The work has already been done for us. God’s grace is fully operative in our lives. His power is alive and operative. We just need to know what He has done for us and how much He loves us. In This episode of Grace Talk learn how you can put on the armor of God and live a victorious life in Jesus! God’s Promises ARE for YOU and You CAN Have Them! There are many promises for God’s children in His Word. So if God’s promises are “Yes” and “Amen” then why don’t we see them all operating in our lives? Why do so many of God’s promises seem so near, yet so far away? It’s not a problem with our faith. God’s Word says we can have faith the size of a mustard seed and mountains will move, so faith isn’t the issue. Unbelief is the real problem. We zoom in and out from God’s Word to worldy information and we allow our hearts and minds to get confused. This makes it harder for us to receieve. All of God’s promises are found in Jesus. We must keep our focus on Him and Him alone. In Mark 5:28 the woman with an issue of blood thought this “…if I just touch His garments I will get well.” She knew where her focus needed to be. She knew where her healing would come from. In all areas of life we need to be like this woman. The word touch in Mark 5:28 is the greek word hapto and it means: to fasten to, adhere to. We need to fasten ourselves to Jesus and His truth, refusing to let go. we need to continue to focus on His person and let His love for us be the only truth we focus on. In this episode of Grace Talk continue to learn how you can fasten yourself to Jesus and not only know about His promises but also, receive them into your life. Are Negative Expectations keeping You Awake At Night? The expectations we have in life play a huge role in how much peace and rest we have living on the inside of us. It’s impossible to live a rested life when all of our expectations are negative. We can’t have peace while focusing on all that could go wrong. We spend more than half of our lives worrying about stuff that never even happens! We don’t have to stay in this place though, we can move into a positive place of good expectations! We can learn to expect GOOD outcomes and STOP living in the fear and anxiety that negative expectations bring us. Tweet this We can expect the worst or we can expect the best, but we can’t do both. 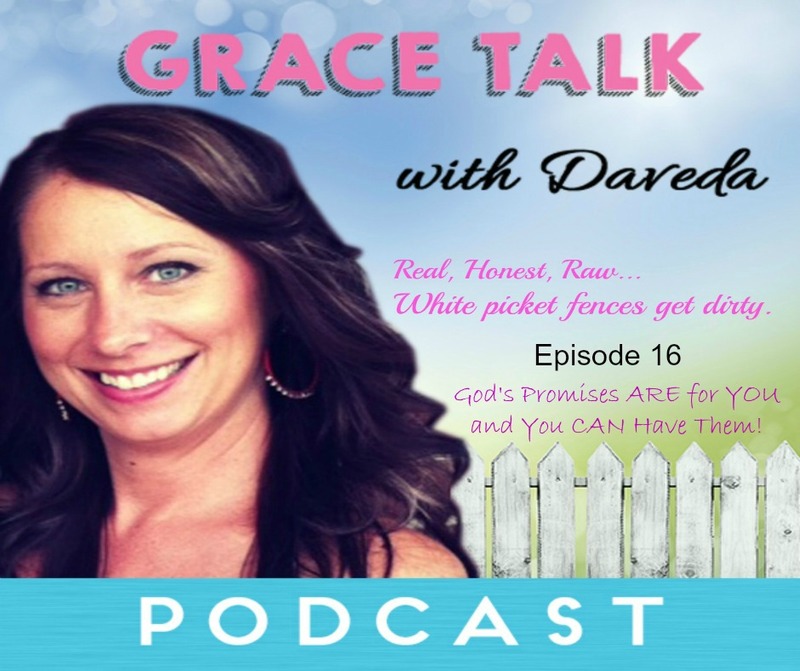 In this episode of Grace Talk learn how we can begin to live in expecation of God’s GOODNESS! ! Is There Punishment In God’s Discipline? Does Discipline really have to do with punishment or does it have to do with love? Do you ever feel as if God is looking at your life and making a check list of all the things you deserve to be punished for? The Bible does say that God corrects those whom He loves, right? If discipline has to do with punishment for the things we are guilty of then we had better all watch out! No one is perfect! I mean NO ONE! If this is your view of how God sees you, I have good news for you! There is NO punishment in God’s correction. Tweet this Jesus took the punishment we deserve, so that we could be judged righteous! In this episode of Grace Talk find out how God really sees you and what the heart behind His discipline is. The term “the Lord will give me strength” is a popular one. Do we really understand what it means, though? If the Lord gives us strength then why do we often feel worn out, exhausted, frustrated and defeated? Tweet this God empowers us, by teaching us to rest in His abilty. In this episode of Grace Talk learn how you can truly be empowered while giving up on all the striving and trying.